LinkedIn Profile Badge can be created using LinkedIn API . Here is step by step guide with tools needed for troubleshooting for successfully creating the badge. The quality of traffic, the possible business connection are obviously very strong with LinkedIn versus any other Social Network. Actually these are topics more related to the topics we used to publish before many a years ago – Communication approaches on social networks, professional way of use of Twitter, Tips and tricks to start and continue a professional and successful blog and like that. With time, there is a change in our target audience, we have moved more towards pure computing part, basically we have expanded the computing part. Digital Photography has a been new niche. Cloud Computing was present since many year. LinkedIn Profile Badge can be created using LinkedIn API, as we have said at the beginning – and we understand the difficulty by many LinkedIn users who actually want a LinkedIn Profile Badge on their website – mostly a WordPress website. Plugins for these kind of purpose is hugely discouraged simply because adding one Plugin adds overhead to MySQL database and its quite difficult to get rid of the added things even if you delete the Plugins. Technically, most data remains in the wp_options Table and its quite difficult, time taking and risky to fully get rid out of them. This is why we write about how to add these kind of things – LinkedIn Profile Badge, Google Plus Profile Badge manually – the purpose is to show the things to the frontend users. The method is nothing but to add some codes using a Text widget in WordPress. Copy paste the URL. These Social Networking websites frequently changes the URL. You might need to search if you are reading after some months or years after publication of this guide. Do not add any URL in those OAuth 1.0 fields and check all the request options. Its a painful form, indeed. You will get the API Key, Secret Key, OAuth User Token and OAuth User Secret. This is normal set for anything that has to do with OAuth and Public Apps. Now you can test with that CocoaRestClient tool (Forth point in the list). Actually you can see on the diagram the header response. So from profile card, actually you can redirect the user to login to your website’s forum on click – which is not possible with a simple default card. This Article Has Been Shared 6679 Times! 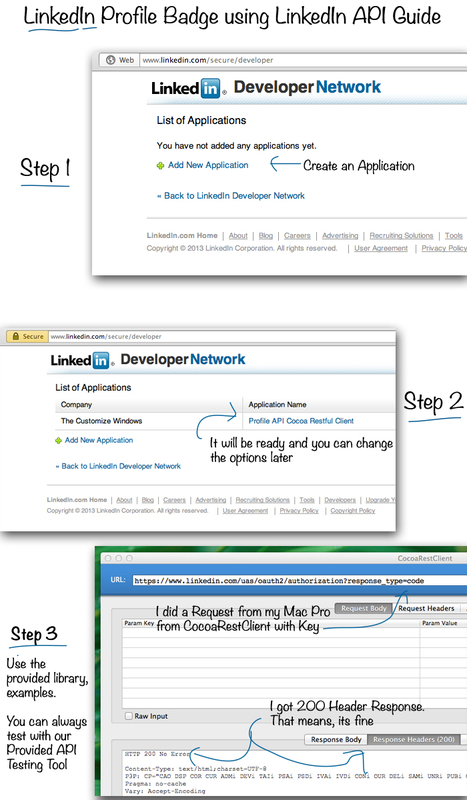 Cite this article as: Abhishek Ghosh, "LinkedIn Profile Badge using LinkedIn API Guide," in The Customize Windows, July 9, 2013, April 21, 2019, https://thecustomizewindows.com/2013/07/linkedin-profile-badge-using-linkedin-api-guide/.